The life of a foreign correspondent who has reported from nearly 100 different countries. A golden age of overseas journalism coincided with a time of “wishful thinking” by the U.S. military, from Indochina to Afghanistan. Born in 1935 and raised in the Boston suburbs to a Harvard ornithologist father who “worked in the vanished age of the gentleman amateurs who went around the world collecting animals and birds for museums,” Greenway did indeed enjoy a privileged childhood and lucky start to a career in journalism as a stringer for Time at Oxford. Becoming a war correspondent by chance, he arrived in Vietnam in 1967 at the first of many eye-opening posts through the decades, trips that revealed to him the horrendous toll of an increasingly horrifying conflict. Sagging morale among the American troops, suspicion by the South Vietnamese and truculence by the Vietcong intensified the overall paralysis. Greenway, who met many of the old journalist Asia hands—e.g., Michael Herr, Joseph Alsop, Frances FitzGerald—takes pains to delineate the array of opinions his colleagues held about the war. 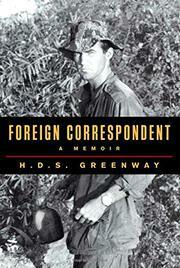 Joining the Washington Post in its Watergate heyday, Greenway continued to cover the war through the fall of Saigon. He also reported on the fall of Phnom Penh to the Khmer Rouge, the bombing of Laos (where, thanks to reporters like Tim Allman and Fred Branfman, the West became aware of the brutal effects of American bombs on civilians)—and other momentous events in Southeast Asia, while his wife and daughters lived mostly in Hong Kong. Greenway provides fascinating detail on the day-to-day travails of the foreign correspondent, and he fleshes out the back story of many of these shadowy conflicts—e.g., the long and charismatic reign of “mercurial” leader Norodom Sihanouk of Cambodia. The author was also the first Post bureau chief in Israel, and he later moved to the Boston Globe, where he provided formidable coverage of the fall of the Soviet Union. Frank, seasoned, expert observations on the folly of U.S. military intervention.